Noah is from San Clemente, California. 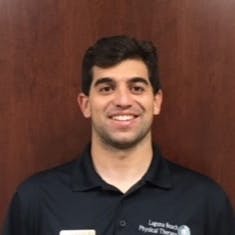 He is a recent graduate from Point Loma Nazarene University with a Bachelor of Science in Applied Health Science. Through receiving treatment himself he became interested in the field of physical therapy. He will be pursuing a graduate degree in Physical Therapy in the near future. In his free time, Noah enjoys playing soccer, surfing, going to concerts, and watching all kinds of sports.